Each of the IQube instruments have LED lights built into them and we are often asked by are they there? Di you know that 60% of the people over 40 suffer from Chronic Pain. The FDA has approved LED (light) therapy for the relief of pain. There are companies making claims of scalar lasers using quantum healing cold laser units in the 650nm and 780nm spectrum. LED’s ARE NOT SCALAR! The colors LED’s create depend on the material used. A Light Emitting Diode (LED) is a solid-state semiconductor device that converts electrical energy directly into light. The dispersion of this energy produces photons with visible wavelengths. The University of Chicago, researchers discovered that the average wavelength of cell tissue in the human body ranged between 600 nanometers and 720nm; 660nm is the mid-point.So in essence, the reason a 660nm works better than any other single frequency is because it is closer to the resonant frequency of cell tissue.The other reason is that 660nm absorbs better in hemoglobin. As you move toward the red end of the spectrum, the rate of cellular regeneration increased. So over the years they migrated to infrared, red and eventually the 660 nanometer wavelength because it was the fastest way to regenerate tissue. So if you have an injury you would normally recover from in ten days, you can actually recover that tissue quicker by treating it with light. Irradiating mitochondria with red and infrared light causes them to produce cytochromes, which increases their efficiency. 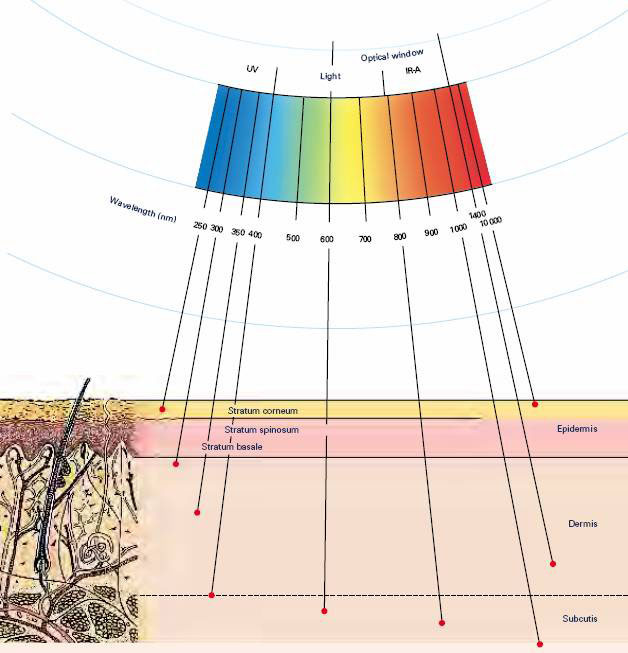 Red and near-infrared light are a “window” of wavelengths that are able to pass through tissue. Red and near-infrared have beneficial effects on cells by “kick-starting” them into immediately creating more ATP (cellular energy) and increasing DNA and RNA activity. This effect has been carefully studied in many published reports since 1987. The positive effects occur only in injured cells. Some conditions known to be helped by LED light therapy: *osteoarthritis, *sports injuries such as knee, ankle, shoulder, etc, *burns, scrapes, and pain relief from cuts, *ulcers, *macular degeneration, *laser burns to the retina, *fibromyalgia pains, *preventing bruising and inflammation if it’s fresh injury, *bunion pain, *diabetic neuropathy, *tendinitis, *myofascial pain, *minimize recent nerve injury, *wound healing, especially in diabetics, *bursitis, wrinkles, aging, acne, spots, *bone healing (it might help), *existing bruises and inflammation, *back pains (hit or miss), *rosacea, psoriasis, eczema, dermatitis, poison ivy. FDA allows advertising red and infrared for minor pains and mild arthritis. Red has been used to help halt dry macular degeneration which may have FDA approval. The following have FDA approval for specific devices: 660 nm red for mouth ulcers in children on a type of chemo. There have been excellent results reported for tendonitis, shoulders, knees, small joints, and fibromyalgia. For most soft-tissue injuries beneath the skin, the pain goes from an 8 to a 2 (on a scale of 10) after an hour or two of treatment with good home-use LED devices. Light reflected from a mirror contains a higher percentage of soft electrons than the incoming light. When photons reach the reflecting surface, they are momentarily stopped. Some scatter and interact with each other to form soft particles. Others meet incoming photons to produce other soft particles before they acquire light velocity again. If light were to be reflected back and forth a sufficient number of times, the result would be a beam containing a very high concentration of soft particles. Soft electrons have the ability to promote chemical changes. In all our applications, we use a mirror surface to encourage such a phenomena. You will not find a better way to relieve pain then playing your personal frequencies through our Scalar Generator and 660 nm LED body pain pad.